A woman named Patricia has come forward accusing Bill Cosby of drugging and sexually assaulting her between 1978 and 1980, joining a chorus of roughly 30 other alleged victims of the comedian. BuzzFeed's Katie J.M. Baker (formerly of Jezebel) landed an interview with the woman, known only as "Patricia" so as to avoid the "media circus." Patricia tells Baker that she met Cosby as a new graduate of University of Massachusetts when he came to the school to speak. She drew up enough courage to thank him for his words and the two began what she thought was a mentor-mentee relationship. He invited her to attend a banquet with him and suggested drinks afterward. 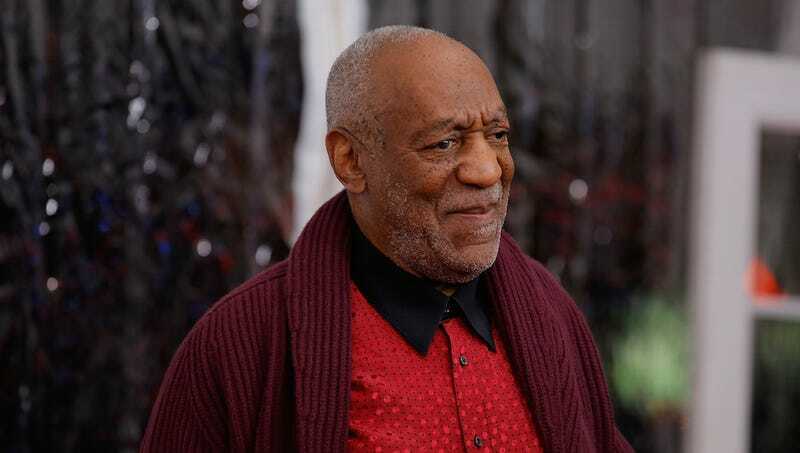 There she shared that she was a singer and Cosby offered to help her get into the entertainment business. He invited her to a private dinner party at his home soon after, which she thought would include his wife Camille, but Patricia arrived to find the table set for just two near a fireplace. "I felt alarm bells go off because it did feel intimate, but I was trying to be so grown up and mature," said Patricia, now 58 years old. The Cosby family photos that lined the walls made her feel more at ease. She accepted the drink Cosby mixed her, along with his bizarre acting improvisation directions: Cosby wanted Patricia to pretend to be an elegant queen with oatmeal dripping all over her face. "It was so creepy," Patricia said. "He told me to convince him that I could remain regal and queenlike no matter what I looked like. I would leave the room and walk back in, pretending to be a queen with oatmeal on her face, and he would tell me I was doing it wrong and to go back and try again. Then, I started to feel weird from the drink. And then I don't remember much." Patricia says she awoke in the comedian's guest bedroom naked with Cosby was standing over her in a bathrobe, a detail many of his other alleged victims mention as well. He told her she'd thrown up and fallen out so he'd had to wash her dress and then he offered her a toothbrush. She believed him and was very embarrassed that she'd acted that way at the home of her mentor, this famous man. She went home and they kept in touch, he sponsored her flights to fancy events, signed her up for acting classes and footed the bill for a gym membership because he said she needed to lose weight. In 1980, he invited her to a live taping of The Dinah Shore Show and demanded that she style her hair in a bun like Queen Noor of Jordan, sending a photo along for good measure. Patricia complied and upon her arrival took a pill from Cosby after he refused to speak with her otherwise. Then she blacked out again. "I was very sick and knew that someone had penetrated me," she said. "Finally, I realized what was happening." When Patricia confronted Cosby, he angrily called her ungrateful and threw her out of his hotel room. For years, she didn't tell anyone what happened because of her own shame and perceived responsibility for what had happened. Decades later, Patricia lives in Northern California and hopes that more of those who were violated by Cosby will come forward to share their stories because they are not alone.